So you’ve walked the Ramblas and nudged your way through La Boqueria. You’ve wandered the beautiful Gothic Quarter and huffed your way to the top of the Sagrada Familia. You’ve nibbled your way through platters of finger-licking tapas and washed them down with a couple of glasses Catalan Cava. Think you’ve ‘done’ Barcelona? Think again. 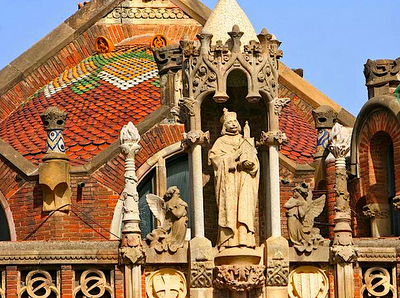 You’ve actually missed out on one of the finest examples of Modernist architecture in the world and one of Barcelona’s most incredible (yet strangely overlooked) constructions – the amazing Hospital Sant Pau. 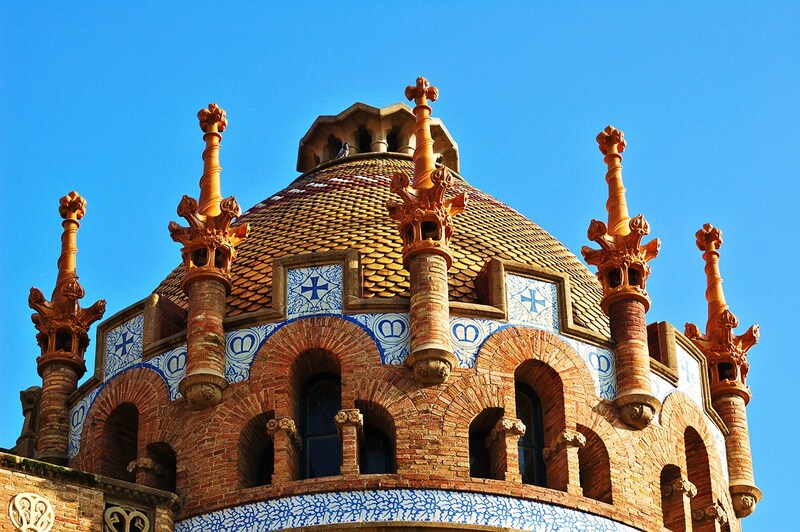 Designed by Lluís Domènech i Muntanter, the man behind the incredible Palau de la Música Catalana and who was actually Gaudí’s teacher, the Hospital de la Santa Creu i Sant Pau was built between 1902 and 1930 and is now categorized as a UNESCO World Heritage Site. 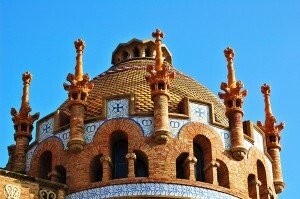 It is one of the most intriguing constructions in Barcelona and well worth taking the time to visit. Known for its beautiful Art Nouveau style and its weird and wonderful shapes and colors, it is true to the Modernism characteristics of the era. It also however has the magical air of a medieval castle. Domed and vaulted ceilings create an elegant, dramatic atmosphere whilst amazingly detailed windows, embellished chandeliers and giant wooden doors, give a real sense of grandeur. The church and library are especially impressive sections of the complex. 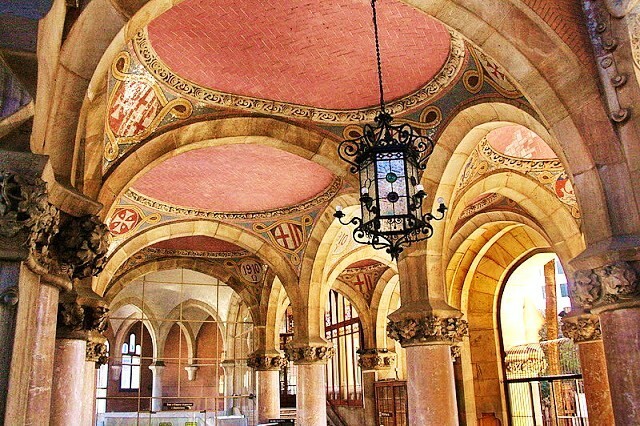 Unlike other hospitals of the time which would have typically been rather depressing places, light and ventilation are important features of the Hospital Sant Pau in Barcelona which, along with its wonderful interior decoration, give a more cheerful feeling to the place. The wonderful mosaics seen around the buildings represent the history of the hospital from its medieval origins to its modernist redevelopment. With a history dating back to the year 1401 and the aftermath of the plague, this medieval hospital, initially named the Hospital de la Santa Creu and located in the Raval quarter, served the citizens of Barcelona for centuries. In 1896, Pau Gil i Serra, a wealthy Catalan banker then living in Paris passed away. 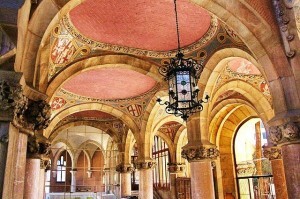 In his will he declared that some of his fortune should be dedicated to the construction of a new hospital in Barcelona. He had two conditions: that the hospital had to be the very best in terms of medicine, architecture and technology; and that it should bear his name. Domenech i Montaner was the man for the job. He dedicated himself to the construction of what was to be the best hospital of the day and designed a truly unique complex to be situated in the new Eixample district. 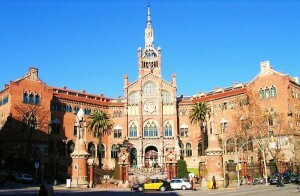 His awe-inspiring Hospital Sant Pau consisted of twelve pavilions all connected by a kilometer of underground passages. His vision was that the building would be a world of its own, a refuge away from bustling city life. Staying true to Pau Gil i Serra, the generous donor’s initials are intricately carved into the façades of the hospital. 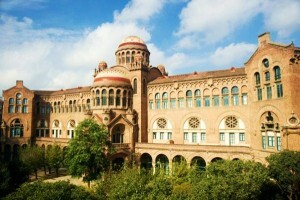 In 2009 the role of Sant Pau as a working hospital came to an end. It is now undergoing renovation work and is being redeveloped as a cultural centre. Visiting the complex is an amazing experience, offering a unique insight into the history of Barcelona and a chance to discover one of its most fascinating corners! It is also possible to visit the original hospital in the Raval, now called Antic Hospital de la Santa Creu i Sant Pau and which is currently home to the National Library of Catalonia. Modernisme Route discount: 50% on both prices. 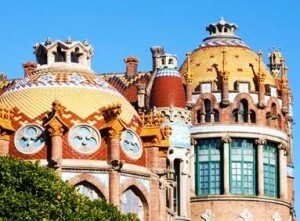 This entry was posted in Home, Things to do and tagged architecture barcelona, barcelona activities, barcelona architecture, barcelona art, barcelona attractions, Barcelona culture, barcelona eixample, modernism barcelona, things to do in barcelona, tourism in barcelona, visiting barcelona. Bookmark the permalink.